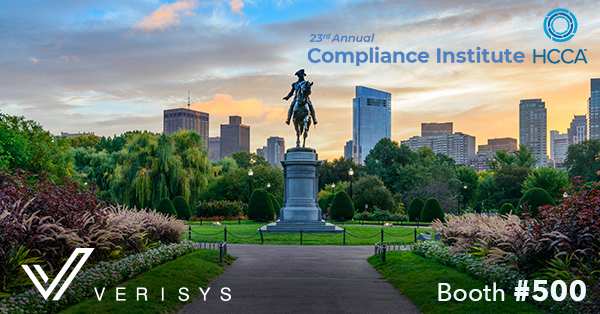 Thousands gather in Boston this week for the annual Compliance Institute put on by HCCA, the Health Care Compliance Association. The Compliance Institute offers the opportunity for members and attendees to collectively address health care compliance issues, connect with colleagues and counterparts, and acquire skills pertinent to the profession of health care compliance. The event features 100+ sessions divided into 14 separate tracks with more than 60 additional sessions held during the pre- and post-conference days. The exhibit hall is filled with solution providers eager to collaborate and offer services to further the role of compliance in health care. The tracks are all-inclusive of the wide range of health care industry areas of focus such as Auditing and Monitoring, Behavioral Health, Post-Acute Care, Privacy and Security, Risk, Quality of Care, Internal Audit, Compliance Law, and Physician Compliance. You can find Verisys at booth #500 and learn more about its data and technology platform CheckMedic® and the MedPass®, powered by its proprietary data set FACIS®. Having a streamlined, cloud-based credentialing process ensures continuous compliance that ultimately protects patients and drives successful outcomes. On the operations side, the use of CheckMedic® reduces fraud, waste and abuse in one’s organization, as well as identifying non-compliant providers among one’s staff. Access to aggregated, current health care data empowers all professionals within an organization including: health care compliance professionals, risk managers, privacy officers, coding and billing specialists, consultants and attorneys, health care regulators, nurse managers and executives, staff educators and trainers, health information management specialists, institutional chief information officers, health care senior executives and leaders, members of the board of trustees of health care enterprises, physicians and other health professionals, health care journalists, researchers, and policy makers with actionable information for their compliance program. Keeping compliance at the forefront of the health care industry is the key to sustainability, healthy provider populations and safer patient experiences.